From the Star Wars Rogue One collection by Kotobukiya. Star Wars Rogue One Death Trooper ArtFX Statue. From the Star Wars Rogue One collection by Kotobukiya. 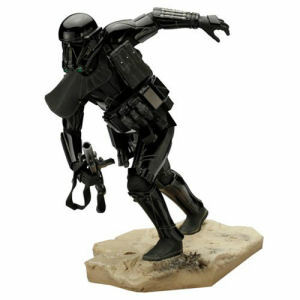 Star Wars Rogue One Death Trooper ArtFX Statue. Death trooper measures 9,5 inches tall and comes on a battlefield base. Kotobukiya Star Wars Action Figures shipping from Canada. No Surprise Border fees or Customs!